Since beginning my blog in 2009, many fabulous doors have opened up for me and I've been so blessed to have the opportunity to do some amazing things. But the best thing about blogging (in my humble opinion) is getting to meet and become friends with other blogging/writing folks! 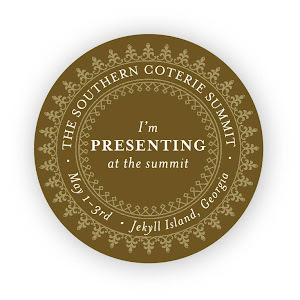 I met some really great people during my recent trip to Jekyll Island for the Southern Coterie Summit. One of them was Ms. Amber Ryder. Not surprisingly, her blog For the Love of the South was a finalist in Saveur Magazine's Best Food Blog Awards. It's a gorgeous site that perfectly reflects the sweet spirit of its creator. 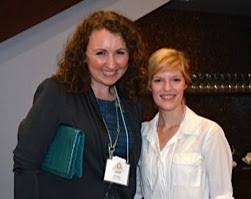 Amber was one of the first people I met at the Southern C Summit. I think we were both looking a tiny bit lost at the opening cocktail reception and I'm so glad she came over and said hello. We struck up a conversation about food, naturally ;) Girlfriend takes her food seriously...anyone who categorizes broccoli salad as "the best of her life" is good people in my book. It took us awhile to realize that we were familiar with each other's blogs already...have you ever met someone in real life that you already felt you knew online? It's kind of an interesting phenomenon. I hope you'll visit Amber's blog and tell her I sent you. You won't be sorry. Did I mention she's a newlywed? Check out her lovely southern wedding too!